König Galerie is pleased to announce its first exhibition by Los Angeles-based artist Kathryn Andrews. Entitled Black Bars, the show will feature a group of large-scale wall-based works as well as free-standing sculpture. The exhibition will open on Friday, September 22, 2017, and remain on view through October 22. Kathryn Andrews’s work disrupts the way perception functions in the contemporary media-saturated landscape. She juxtaposes highly iconic forms, such as pop-inflected imagery and Hollywood props, with abstract and minimal ones that have an intense material presence. Her combines prompt viewers to waver between seeing in terms of images and illusions (a mode associated with pop art) and seeing in terms of materials and objects (a mode associated with minimalism). As such, the work moves toward resolving the apparent opposition between these two historical approaches in art. Black Bars draws its title from an ongoing series of wall-based works inspired by Manet’s landmark painting Le Déjeuner sur l’herbe, in which a picnic scene is imbued with disconcerting sexual tension and jarring incongruities of scale. Andrews uses these themes as a fulcrum in order to address the deep-running connections between image and desire in the Western cultural canon. Random screen-printed assortments of objects that symbolize easy pleasure and leisure activity surround the faces of young women on a white painted ground, updating Manet’s spread with a more contemporary and at times comedic language that could be seen as reminiscent of fashion advertising. While some imagery is licensed, much is in fact produced in photo shoots arranged by the artist herself. By recreating what would otherwise pass as stock images, Andrews situates her own authorship within a system whose commercial motives are defined by conscious and unconscious expressions of desire, calling attention to ways in which the human subject can be rendered––and function––as a prop. At almost 2.5 meters tall, the works possess a monumentality further accentuated by imposing black bars screen-printed on the inside surfaces of the acrylic glass panes that separate the viewer from the images behind them. 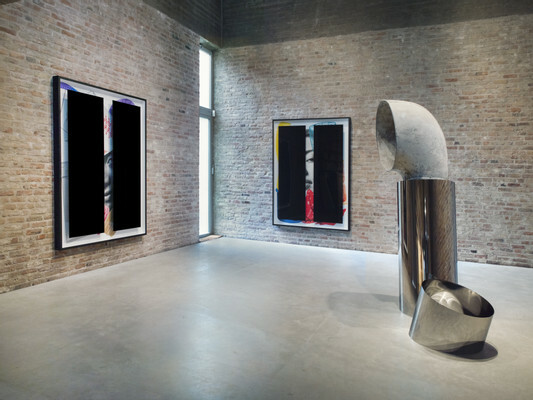 Blocking the images in their totality, the black bars deny access to the illusions of pleasure beyond, focusing attention on the immediate physical properties of the object before the viewer: the reflectivity of acrylic glass, the textures of the painted substrate within the frame, and the colors and qualities of the ink that makes up the images. Andrews’s command of printing techniques allows her to imbue two-dimensional forms with a palpable sense of weight. 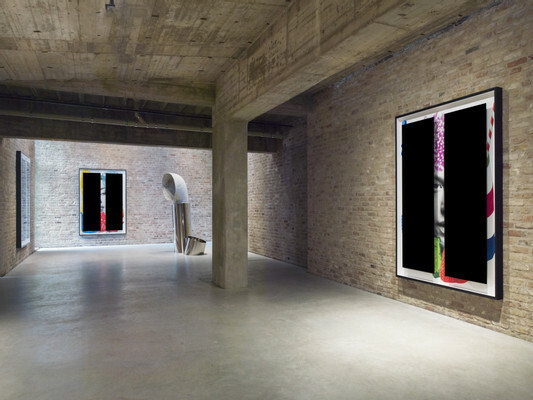 As the viewer moves towards the images and begins to decode them, they break down into their constituent material parts. Their content is therefore not limited to the cultural narratives they symbolize, but also includes the means by which they appeal directly to the senses. On the one hand, Andrews’s practice embodies the image-based criticality often associated with the Pictures Generation, as she demonstrates a willingness to embrace familiar representational forms. On the other hand, her work is closely aligned with several strains of minimalism in which such forms would be considered anathema. Her interest in opticality, for instance, evokes West Coast precedents set by the Light and Space artists, who also questioned how and what a viewer perceives when encountering an artwork. Over the last five years Andrews has developed a series of sculptures, featuring the use of human-scaled stainless steel tubes, in which these seemingly divergent fields of inquiry are shown to be interdependent. 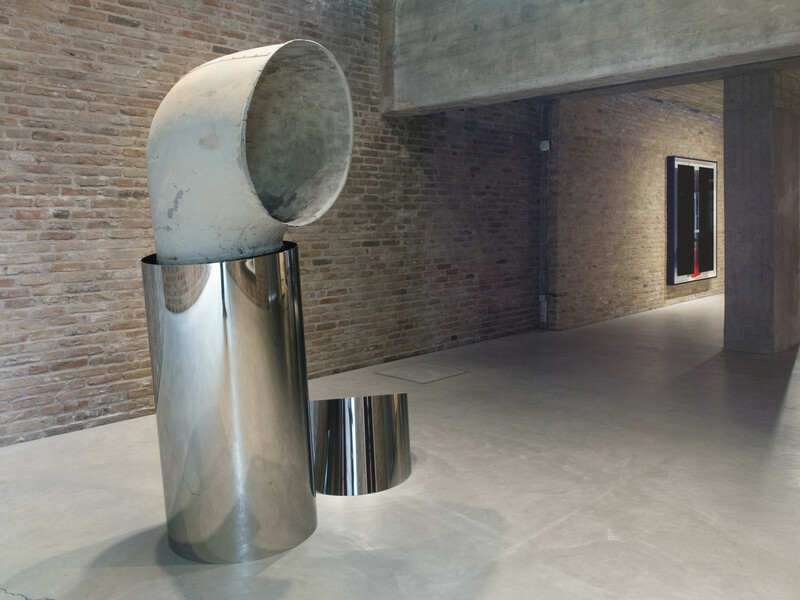 In the newest of these sculptures, Andrews employs two steel tubes as framing devices for a certified prop from the 1997 film Titanic. A horn-shaped vent that was part of the underwater set used to depict the sunken ship, the prop shares clear formal similarities with the steel tubes alongside which it is displayed. 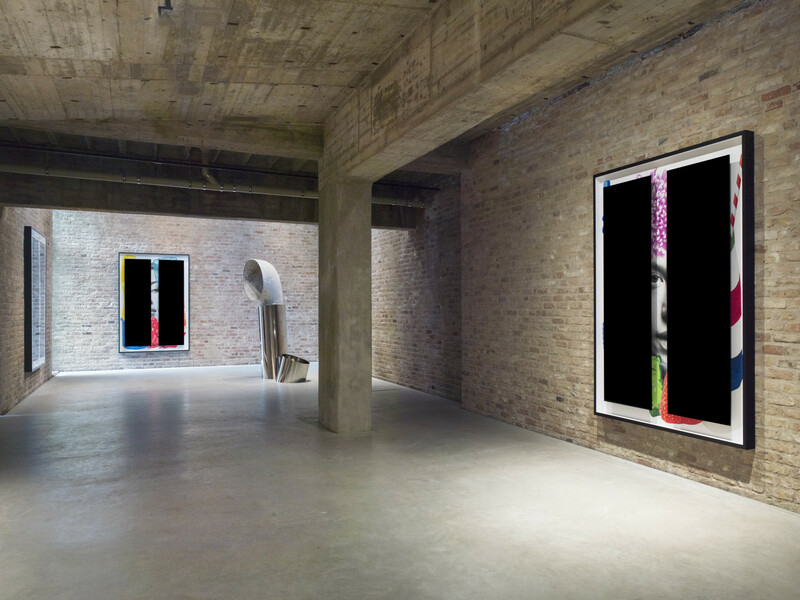 The three tubes can be read as parts of a single, continuous, abstract object whose effects are based on the variety of its shapes, colors, and surface textures. But the work also retains mimetic relationships to external forms on a variety of levels, including nautical imagery in general, the specifics associated with the film Titanic, and the actual history of the Titanic’s ill-fated voyage. These contradictions become only more pronounced when the viewer peers into the tube that holds the prop: if its upper portion offers some semblance of fidelity to a real vent, the prop’s lower section reveals the foam and other materials that make it no more than an example of three-dimensional trompe l’oeil. Unlike the comparative perfection of the stainless steel, the Titanic readymade shows signs of use and age. Its deterioration is a reminder that icons and images, which move through the culture as if exempt from the laws of nature, are in fact dependent upon their physical substrates, and are thus as vulnerable as the materials in and on which they appear. If such images achieve any kind of reprieve from this condition, they do so only in the minds and memories of their viewers. In 2017, Kathryn Andrews (b. 1973, Mobile, Ala.) will present her work in Field Station, a solo exhibition at the Eli and Edythe Broad Art Museum, Michigan State University, East Lansing, Mich. Other recent solo exhibitions include Kathryn Andrews: Run for President, Museum of Contemporary Art, Chicago, and Nasher Sculpture Center, Dallas; Sunbathers I & II, The High Line, New York; Temporary Contemporary, Bass Museum of Art, Miami; and Special Meat Occasional Drink, Museum Ludwig, Cologne. Recent group exhibitions include Reconstitution, LAXART, Los Angeles; 99 Cents or Less, Museum of Contemporary Art Detroit; High Anxiety: New Acquisitions, Rubell Family Collection, Miami; Progressive Praxis, de la Cruz Collection Contemporary Art Space, Miami; Good Dreams, Bad Dreams: American Mythologies, Aïshti Foundation, Beirut; The Fleeting Image: Four Contemporary Artists, Nasher Museum of Art at Duke University, Durham, N. C.; and The Los Angeles Project, Ullens Center for Contemporary Art, Beijing. Andrews lives and works in Los Angeles. König Galerie freut sich, die erste Ausstellung von Werken der in Los Angeles lebenden Künstlerin Kathryn Andrews anzukündigen. In der Black Bars betitelten Schau, die am Freitag, den 22. September 2017 eröffnet und bis zum 22. Oktober zu sehen ist, zeigt sie eine Gruppe großformatiger Wandarbeiten sowie freistehende Skulpturen. Kathryn Andrews’ Werk durchbricht die Wahrnehmungsgewohnheiten unserer mediengesättigten Gegenwart. Sie stellt hochgradig ikonische Formen wie popkulturell geprägtes Bildmaterial und Hollywood-Requisiten neben abstrakte und äußerst reduzierte Gebilde, die sich durch intensive materielle Präsenz auszeichnen. Ihre Combines lassen den Betrachter zwischen einer bildlich-illusionistischen Sehweise (wie in der Pop Art) und der Wahrnehmung von Materialien und Objekten (wie im Minimalismus) schwanken. So zielt ihre Arbeit auf eine Auflösung des augenscheinlichen Widerspruchs zwischen diesen zwei historischen künstlerischen Ansätzen. Der Titel Black Bars stammt von einer wachsenden Serie von Wandarbeiten, zu denen die Künstlerin sich von Manets bahnbrechendem Gemälde Le Déjeuner sur l’herbe inspirieren ließ, in dem eine Picknickszene mit verstörenden sexuellen Spannungen und krassen Maßstabsmissverhältnissen aufgeladen ist. Diese Themen dienen Andrews als Angelpunkt für eine Untersuchung der tief verwurzelten Verbindungen zwischen Bild und Begehren im westlichen Kulturkanon. Auf weißem Grund um die Gesichter junger Frauen herum angeordnete Siebdruckdarstellungen zufällig ausgewählter Dinge, die für unkomplizierten Genuss und Freizeitvergnügen stehen, übersetzen Manets Gegenstandswelt in eine zeitgenössischere und manchmal humoristische Sprache, in der Anklänge an Modewerbung unübersehbar sind. Ein Teil des Bildmaterials ist zugekauft, aber der überwiegende Teil entsteht in von der Künstlerin selbst organisierten Fotoshootings. Durch diese Nachschöpfung von Bildern, die sonst als Stockfotografie durchgehen würden, situiert Andrews ihre Autorschaft in einem System, dessen kommerzielle Motivation durch bewusste und unbewusste Äußerungen von Begehren bestimmt ist, und zeigt so auf, wie das menschliche Subjekt als Requisite dargestellt werden – und fungieren – kann. Die Monumentalität der beinahe 2,5 Meter hohen Arbeiten wird noch durch die achtunggebietenden schwarzen Balken betont, die mittels Siebdruck auf die Innenseiten der den Betrachter von den Bildern dahinter trennenden Acrylglasscheiben aufgebracht sind. Indem sie eine Gesamtschau verhindern, versperren sie den Zugang zu der hinter ihnen liegenden Illusion von Genuss und lenken die Aufmerksamkeit auf die unmittelbaren physischen Eigenschaften des Objekts, dem sich der Betrachter gegenübersieht: das spiegelnde Acrylglas, die Texturen des bemalten Bildträgers im Rahmen und die Farbtöne und Beschaffenheit der Druckfarben, aus denen die Bilder bestehen. Andrews’ Beherrschung diverser Drucktechniken erlaubt es ihr, zweidimensionalen Formen fühlbares Gewicht zu verleihen. Nähert sich der Betrachter den Bildern, um sie zu entschlüsseln, zerfallen sie in ihre materiellen Bestandteile. Zu ihrem Inhalt gehören daher nicht nur die kulturellen Erzählungen, die sie symbolisieren, sondern auch die Mittel, mit denen sie unmittelbar die Sinne ansprechen. Einerseits verkörpert Andrews’ Praxis die bildbasierte Kritikalität, die oft mit der Pictures Generation assoziiert wird: Sie nimmt sich bereitwillig vertrauter Repräsentationsformen an. Andererseits lehnt ihr Werk sich eng an diverse Strömungen innerhalb des Minimalismus an, die solche Formen rundweg scharf ablehnen würden. Ihr Interesse an Optikalität etwa erinnert an Vorläufer von der amerikanischen Westküste wie die Künstler von Light and Space, die ebenfalls der Frage nachgingen, wie und was ein Betrachter wahrnimmt, wenn er einem Kunstwerk begegnet. In den letzten fünf Jahren hat Andrews eine Reihe von Skulpturen mit in ihren Dimensionen auf den menschlichen Körper abgestimmten Edelstahlrohren entwickelt. Sie zeigen, wie diese scheinbar getrennten Untersuchungsfelder ineinandergreifen. In der jüngsten dieser Skulpturen setzt Andrews zwei Stahlrohre als Rahmen für ein authentisches Requisit aus dem Film Titanic (1997) ein. Der hornförmige Schlot, der zu der Unterwasserkulisse gehörte, die das gesunkene Schiff darstellte, zeigt deutliche formale Ähnlichkeiten zu den Stahlelementen, mit denen er gemeinsam zu sehen ist. Die drei Rohre sind als Teile eines einzigen in sich geschlossenen abstrakten Objekts lesbar, dessen Wirkung auf der Variation von Formen, Farben und Oberflächentexturen beruht. Zugleich bleibt die Arbeit mimetisch mit verschiedenen ihr äußerlichen Ebenen – der Bilderwelt der Seefahrt im Allgemeinen und des Films Titanic im Besonderen sowie der realen Geschichte der Unglücksfahrt der Titanic – verknüpft. Diese Widersprüche treten umso deutlicher hervor, wenn der Betrachter in das Rohr blickt, das das Requisit trägt: Während der obere Teil die einigermaßen getreue Nachbildung eines wirklichen Schlots zu sein scheint, sind weiter unten Schaumstoff und andere Materialien zu erkennen, die das Requisit als ein bloßes dreidimensionales Trompe-l’oeil ausweisen. Im Gegensatz zu den vergleichsweise makellosen Edelstahlelementen zeigt das Titanic-Readymade Gebrauchs- und Alterungsspuren. Seine Abnutzung erinnert daran, dass ikonische Objekte und Bilder, die in der Kultur zirkulieren, als wären sie von den Naturgesetzen ausgenommen, tatsächlich auf materielle Träger angewiesen und daher nicht weniger anfällig sind als die Materialien, in und an denen sie erscheinen. Nur in der Wahrnehmung und Erinnerung ihrer Betrachter können sie eine Zeit lang ihrem unausweichlichen Schicksal entgehen. 2017 wird Kathryn Andrews (geb. Mobile, Ala., 1973) ihre Arbeiten in der Einzelausstellung Field Station im Eli and Edythe Broad Art Museum an der Michigan State University, East Lansing, Mich., zeigen. Weitere Einzelausstellungen zuletzt:Kathryn Andrews: Run for President im Museum of Contemporary Art, Chicago, und im Nasher Sculpture Center, Dallas, Sunbathers I & II auf der High Line, New York, Temporary Contemporary im Bass Museum of Art, Miami, und Special Meat Occasional Drink im Museum Ludwig, Köln. Beteiligungen an Gruppenausstellungen zuletzt: Reconstitution im LAXART, Los Angeles, 99 Cents or Less im Museum of Contemporary Art Detroit, High Anxiety: New Acquisitions in der Rubell Family Collection, Miami, Progressive Praxis im de la Cruz Collection Contemporary Art Space, Miami, Good Dreams, Bad Dreams: American Mythologies in der Aïshti Foundation, Beirut, The Fleeting Image: Four Contemporary Artists im Nasher Museum of Art an der Duke University, Durham, N. C., und The Los Angeles Projectim Ullens Center for Contemporary Art, Peking. Andrews lebt und arbeitet in Los Angeles.